I have updated my tracking chart of public opinion polls asking Salvadorans about their choices in the 2014 presidential election with recently released polls from Inmore Research, ARENA and Data Research. Tony Saca -- 20.7% As the tracking chart shows, poll results are varying quite a bit. The variation is caused mostly by differences in who is doing the polling and how they do it, rather than changing preferences of the voters over time. So many discrepancies can only lead one to a conclusion. All surveys are false and that is regrettable, because they rob citizens of an important tool to decide how to vote and, what is worse, are deceiving them, to accomplish some goal. UPDATE -- UTEC-CIOPS published a new poll this morning which I have added to the tracking chart. Today activists took to the streets of El Salvador yet again to demand that the National Assembly approve a proposed national water law designed to protect El Salvador's endangered water resources. Want to know how long this struggle has been going on? Check out my 20+ prior posts labeled with the tag "water." One of the central organizations is the Foro del Agua, with a website at this link. The commander of one of El Salvador's notorious death squads, active during the 1980-92 civil war, could soon become the first top-ranking Salvadoran officer to face trial for murder. But if so, he will be tried in Spain, not his own country, where an amnesty protects even those guilty of atrocities against civilians. Inocente Orlando Montano was quietly working in a sweet factory in Massachusetts in May 2011, when he and 19 others were indicted by a Spanish court for their alleged role in the 1989 murder of six Jesuit priests, along with their housekeeper and her teenage daughter. The Human Studies Film Archive at the Smithsonian in Washington, D.C. has recently posted several clips of film footage from cities in El Salvador dating back to 1946. The clips are from Thayer Soule's travelogue, "The Road to Panama", archived in the Human Studies Film Archives, Smithsonian Institution. For more information, view the complete catalog record: http://tinyurl.com/HSFAcatalog. For information on Thayer Soule see SIRIS blog post: http://tinyurl.com/qyn6fkd. A new article written by Lily Moodey at the Council of Hemispheric Affairs, looks at the continuing opposition to the Public Private Partnership Law (3P) by labor, environmental and civil society groups. The law was passed in May with strong support of the US, and is intended to allow El Salvador to contract with private corporations to perform various governmental functions. The Center for Democracy in the Americas has published a video of interviews with gang leaders in El Salvador's prisons talking about the gang truce. According to CDA: During a recent research trip, CDA was given the opportunity to meet with the leaders of five gangs, who were brought together from separate penal institutions to Mariona Prison. Later that day, we traveled to Cojutepeque Prison, where we met with other leaders and were permitted to tour the extremely overcrowded, run-down facility. There were a few victories claimed by the anti-mining movement in El Salvador in the past few weeks. Those victories are more about economics than about the environmental impact of gold mining. Yesterday came the news that the international arbitration tribunal had dismissed the proceeding brought by the Commerce Group for lack of payment of funds. The case was actually won by El Salvador back in March 2011. The Commerce Group tried to appeal the decision and get it annulled, but it could not come up with the $150,000 which the arbitration tribunal insisted be paid for Commerce Group to proceed. Salvadoran human rights lawyer David Morales has been elected by the National Assembly to be the new Human Rights Ombudsman ("PDDH" for its initials in Spanish) in the country. Morales replaces the outgoing Oscar Luna. Morales has a long history of working in the field of human rights in El Salvador, having worked at Tutela Legal, FESPAD, the office of hte PDDH and most recently within the Funes administration. The PDDH has no real power in the country except to shine light on violations of human rights, conduct investigations and issue reports. Despite that lack of power, an effective PDDH can alter the debate on such topics within the country. 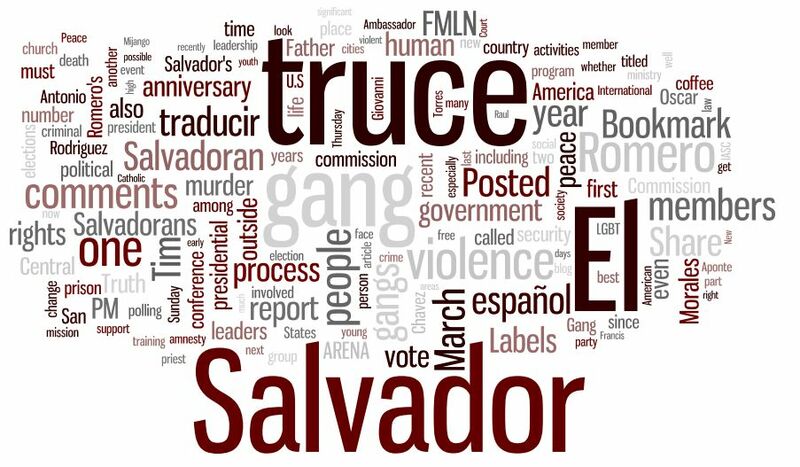 Worth reading and re-reading each and every month is the El Salvador Update from the Center for Democracy in the Americas. The update for July has much information about the security situation and the gang truce, as well as sections on politics and the judiciary.